Festival Cruises is a company owned by the Greek Poulides family, who begun to own and manage cargo ships fifty years ago, and others experienced shareholders. But in the late eighties, George Poulides, the present chairman, had foreseen the growth of the cruise trade worldwide, and specially the European holiday market. Their first step was in 1987, when they bought The Azur from the French owner Paquet. She was a converted ferry, then charteted to the Chandris group for seven years while the owners refined plans for their own brand. The second step was a disaster. In the late 1989, they purchased their second cruise ship, the Veracruz, a former passenger cargo liner built in Germany in 1957 to be used in the Palestinian war. Her former owners, Bermuda Star Line, (which were take over by the Scandinavian group Effjohn in late 1989), sold the ship for about $ 10 million to Festival Shipping & Tourist Enterprises Ltd., the Poulides core branch. The ship was in very bad condition, as a matter of fact she was detained in August by the US Coast Guard due to safety regulation so Festival planned to rebuild her completely in order to make short cruise from Cyprus under Panamanian flag as the Sun Ambassador. So, she arrived at Piraeus on 23 February, 1990 and began a long $20 million refit in Perama. But later, those plans were abandoned and the ship was rechristened The Fiesta, in order to become the first Festival cruise ship, with a planned schedule of Genoa departures. But on 14 October,1991, she caught fire and she sank. Some months later she was salvaged by Smit Tak and broken up in a Greek yard. In 1994, the charter of The Azur ended and Festival began to manage the ship directly. Festival Cruises was born and made her first cruise in March that year. The company was the first cruise line to concentrate squarely on the European market, operating The Azur in Europe for the full year. In a strange coincidence, another European operator, Costa Crociere, was facing stiff competition from Carnival Corporation and so withdrew from the American Cruise market in 1994 to focus its attention on Europe. 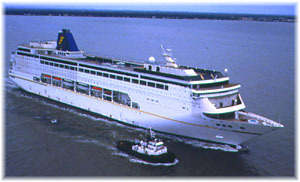 In January the year after Festival, in response to the wide demand, bought Starward from NCL with December 1995 delivery and renamed the vessel Bolero. She made her first Festival cruise on 30 March,1996, and became the consort to The Azur in the 1996 summer Mediterranean season. In the 1996-97 winter season, the Bolero fulfilled her first Caribbean charter. As the Festival was expanding it needed a third ship and so in January 1997, they bought the Southern Cross, a former Princess cruiseship, to become the Flamenco. The last and most important step in this expansion was the deal with Chantiers de L'Atlantique ordering their first newbuilding, a 600-cabin cruiseship that later became the Mistral. - The Mistral replaced an order for two vessels placed by Renaissance Cruises in the summer of 1996, which fell through and left the yard suddenly with a dearth of new contracts. - The yard and its bankers own the ship throught a company called Auxiliaire Maritime. Festival chartered the ship for the first 12 years, with option to purchase her any time after the first six years. - While the tendency of the industry is to order mega-ships, Festival broke the trend and ordered a medium-size cruise ship. 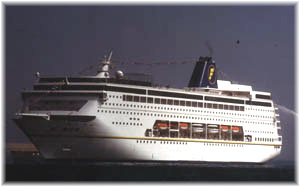 - The company developed a strong management and sales structure and achieved the ISO 9002 accreditation in 1994 (it was established a quality programme in 1993) and ISM certification in 1995, long before it became obligatory, and became one of the first cruise operators in accompliance with environment standard ISO 14001. - Festival is proud of its safety and reliability record, and will extend this policy to reduce its environment impact. - Festival manages direct sales in 10 old continent countries and also openend its first marketing channels to Eastern Europe in Poland. 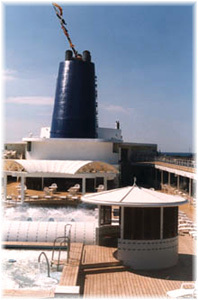 They also opened their American branch, known as First European Cruises, in 1997. Unlike American passengers, Europeans, who have multi-cultural requirements, are a more difficult market requiring close monitoring and finely tuned services. Festival has a strong Pan- European vocation, as a matter of fact the Euro was choosen as the official onboard currency on Mistral. Her entertainment program on board appeals to the broad mixture of passenger, such as daily programs and menus as well. The staff and signposting are multilingual. At the delivery ceremony, the Festival chairman, George Poulides said "We are a European company, operating all over Europe, and it is only fitting that Mistral is the product of great European designers and a great European shipyard. As shown here today, the French public has taken our new vessel to their hearts and I am confident that people throughout Europe will have the same warm reception". The Mistral was christened at her shipyard in St. Nazaire. Among the VIPs were the prime minister of France Lionel Jospen and Claude Deschamps, the ship's godmother, wife of the soccer star Didier Deschamps. The ubiquitous bottle of champagne was broken across the Mistral's bow, which sat beneath a giant French flag. 1. She is the first cruise ship built by Festival. She is also the unique French flagged cruise ship destined for customers of different nationality. 2. All the cabins, inside and outside except the ones with the balcony, have the same area. Furthermore all the cabins are in the superstructure, far from the noise and vibration sources. 3. The adoption of IGBT technology converters means a 12% saving in size and weight, and a higher performance in efficiency, noise and vibration levels to those offered by a conventional cycloconverter based on a diesel electric plant. The Mistral has eight passenger decks for passenger use, all named after European capitals. The Mistral main designer was the Greek firm AMK Architects & Designers, widely identified in recent years for the latest generation of Celebrity cruise ships. Her style is reflected in the use of wood or wood treated decoration in 90% of the public areas, balancing the use of modern materials and the use of blues in all public spaces, that cover 10,500 square metres. A warmer atmosphere was so created which suited to European taste very well. The furnishing is better than the expectations for a moderate-priced cruiseship, a tribute to her builders. Starting from the lower passenger deck, at Paris deck (5), we find amidships the two seat L'Etoile main dining room, which is forward of the main galley which is positioned aft on this deck. L'Etoile is an 'O' form around the engine casing, and the floor around is elevated to improve the vision. She is a full width dining room, with big rounded windows in the outer bulkheads, which are also decorated with beige and cream stripes to create a warm ambiance. The engine casing bulkhead is decorated with mirrors. There are tables for 2, 4, 6 and 8 people, fitted with chairs (without armrests) and sofas. This is a beautifully decorated room with white ceiling, with gondola shaped light fixtures above the four pantries, but it is also noisy and there are a lot of wooden covered pillars (24). The forward entrances are very beautiful, with marble floor, and are fitted with showcases that display European wines that are later served in the dining room. The waiters are not distributed well around the dining room (they are positioned in four places). This sometimes causes a confusion. I think the service should be improved and better training should be given to the waiters that come from East Europe and Asia. The food was good and well presented, and you can order seconds. 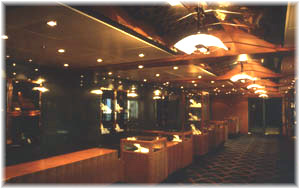 Forward of the dining room, in the starboard side, is the shopping gallery, one of the finest decorated and lighted spaces on board, with wooden pillars, mirrored prismatic ceilings and crystal bulkheads in the central mall area, well planned and spacious. Forward Chez Georges that is decorated in soft blue tones and live music making the room intimate and comfortable, there is the two deck high atrium La Concorde with a marble star and the usual piano, a waterfall forward and a circular light fixture on the ceiling. All pillars and the bulkhead are wooden covered as well. This space was designed as a meeting and conversation place with an intimate cafe' on the upper level and the decoration is in blue and green tones, with big picture windows on the upper deck. The lower level houses aft the information desk, and also the passengers' embarkation shell doors, fitted with metal detectors and scanners. 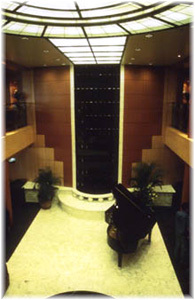 The moderate size of the atrium is a common feature on all European destined new cruise ships, like the Deutschland, Oriana, etc. as opposed to the ones designed for the American market which have big multideck atriums. It also lacks panorama elevators (another European feature). Forward of the Atrium is the other two-deck space on board, the 755 seating Carousel Show Lounge. This slopping floor, without pillars a unique design, which allows a good view from all the seats. It is beautifully decorated in violet tones, with red and blue details. The lighting is spectacular: the ceiling has fiber optic and halogen devices, and the wooden walls contain indirect lighting. The furniture is composed of Sofas, banquettes and glass cocktail tables. The semicircular black stage is generous in size, with an orchestra pit. There isn't a bar inside this lounge, but the Bar des Artistes is a very good alternative on deck 5. It is decorated with Hollywood star portraits, and movie souvenirs. Two small rooms, the Library and the Cigar Room (another Celebrity feature) are located close the Cafe' des Artistes, but tend to be used in daytime. In the poop of the Rome deck (6) is located the open seating full width 262 seat Rialto Grill, a 'U' shaped restaurant with a 120 seat outdoor section that I think will be never used at sea with high winds. In the port and starboard areas, there are tables for two inside and tables for four people outside, intented for an intimate dinner, while the passengers seated in the ample aft section can enjoy the ship wake. The decoration is blue and yellow, with big picture windows to ensure good views. The menu is proposed and inspected by seven renowned European chefs from different countries, all membership of the Bocuse d'Oro association. This restaurant is destined for all suites passengers, but it is also open to the rest of the passengers with a reservation in advance and an extra payment (the ship has a cashless payment system). This means that there are two different passenger classes on board, a novelty in the cruise market, which tends towards a more free policy such as open alternative restaurants. Forward, the passengers find two shopping areas, the blue decorated Via Condotti at port side, with the latest jewellery novelties, and the photo gallery Via Veneto starboard, conveniently located where the movement is intense. The photo display stands can be folded away when the photo gallery is closed and they also show art collection photos. Both the spaces are beautifully decorated and illuminated, with neon lamps and indirect lighting. Located amidship is also Il Borsalino, an intimate piano bar with wooden decoration, with reflecting ceiling and stainless steel ligthing sculpture and pillars. This room loses some of its attraction due to the very bright lighting. This room could be an important meeting place before meals if it weren't located so far from the dining room entrance. The Casino is small for the American standard, with only twelve slot machines, two black jack tables and one roulette table. The ship is well prepared for incentive and meeting uses, and the San Marco room is fitted with the latest technical equipment. The main show lounge can also be used for this purpose. Forward this room, on the second level of the Atrium, is located the Caffe Greco, and in the forward part of the deck, the second level of the Carousel lounge. 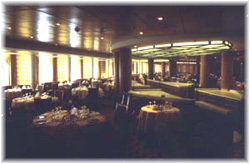 The Mayfair Lounge is located above the main lounge, on deck 7 (London) and is designed for day and night use, with grey tones and a lot of pillars. It is the main nightclub on board, with a dance floor and live music where one can dance after the cabaret entertainment. There is a bar in the port side, with lighted zebra skin pillars and other interesting light arrangements. Its acoustic insulation must be improved to avoid noise in the cabins on deck 8. In this bar the seats are all on the same level, which makes viewing difficult in some cases. In the daytime certain social programs can take place there. In the daytime it is also the best time to visit the magnificent card room St. James Club, which strongly reminds one of the Celebrity Michael's Club. The intimacy of this English style room provides an atmosphere of calmness, far from the night hyperactivity. People can move up and down by means of three stairtowers each fitted with two elevators, and walk around without problems thanks to a well planned design. The boarding deck, beeing the lowest accessible to passengers, allows a good orientation for passengers. But, the Mistral has some disadvantages: firstly, the ship has a central staircase and elevators all coming down on the side of the information desk. This means that you can easily get lost on board. Secondly, the signs certainly don't solve the problem. So, it's necessary to mount more contrasted signs on board. They are located on decks 11 and 12. Aft deck 11 (Cannes) there is the "U" shaped La Croisette buffet, the casual indoor/outdoor dining area, ideally conceived for breakfast, lunch and afternoon snacks. It can seat 300 passenger close together the pool, with two lines port & starboard and a drink bar which opens to the ample stern section. It is fitted with ample square and round tables and a green decoration. The bay windows allow a very good contact with the sea and their decoration, blue and green with lots of lightwood, gives this room a gay ambience. Amidship on this deck is the Costa del Sol lido facilities, which encloses two pools, two jacuzzis, a band stand, the Gelateria Festival aft and the mahohany Saint Tropez Bar forward. Teak has been used only around the pools and all the forniture are plastic made. This area is ample and well planned, but lack of wind screen in the upper deck; so, in windy days, the passenger will need more shelter devices to enjoy the sun. Just forward of the pool area is located the beauty and gymnasium section, operated by Steiner, which is divided into three general areas, all reaches by a "U" shaped lobby. The starboard area contains a hair salon with several massage rooms; the forward area, with floor to ceiling windows, contains the gymnasium. The port side houses the thalasso, the fully-tiled sauna and Turkish bath room. The teen and kids facilities are located in this area as well, managed by professional nurses. Festival seeks for the family market and this ship is ideally fitted for this important segment. The upper deck 12 (Madrid) houses, behind the funnel, the Ibiza Club, the ship's disco. This room is like a Royal Caribbean's Crown Nest, surrounded by floor to ceiling from picture windows, and a plain pink decoration. It also houses a big wood and glass rounded bar, and a stainless steel made dance floor and pillars, but her decoration is too light (mainly the ceiling) for a disco, and could be improved. It also has too much seat and tables, and movements are difficult. Forward this room there is a lot of sunbathing area overlooking the pool area, and sport facilities up the Sporting Club. The Atrium and the main inside public spaces are located in the hull, while all the cabins are in the superstructure, in three decks (10, 9 and 8) in a row, and in the aft third of deck number 7. There isn't any outside cabin with restricted views. There are 518 standard cabins, 295 of which outside. All have the same surface (14 square metre) and are fitted with TV, shower, minibar, radio, phone, safe, etc. 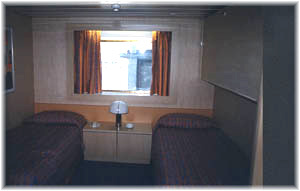 All cabins have two lower beds, which can be transformed into a king size bed. There are also on board four bed cabins for families and two big cabins for disabled travellers. The TV is a powerfull communication device: you can make reservations, take a shore excursion, etc. Furthermore, other detail of the Festival's family oriented philosophy, the TV screen can also work as a PlayStation device (at extra charge). There are also eighty 22 square metre superb suites with private balcony, all located on deck Athens (10). All are fitted with a full bath with marble floor, a sitting area and a blue and red decoration with lots of light woods. After her delivery, Festival operated the ship in the summer European season, and she sailed in her first money earning voyage as Mistral the 17 July 1999, a 7-day Greek Island cruise to the Aegean Sea from Genoa. In this route, her rival was the bigger ship of the Costa's fleet, the Costa Victoria. It will be very interesting to check at the season's end if a 50.000 TRB cruise ship can compete profitably with another 50 % larger. Later, in the lower autumn season, she made some singular Mediterranean voyages from Genoa to the Holy Land, and also sailed to new cruise ports in the Mediterranean, such as Tartus and Beirut. Following the maiden Mistral's Mediterranean season, Festival will send for first time a cruiseship by their own to the Caribbean (formerly they only chartered their ships to other operators). Mistral's Caribbean cruises will be mainly sold in the European market. So, after a transatlantic voyage from Genoa to Guadalupe, that will begin on 7 December, the Mistral will sail two very special cruises from Guadalupe: the Christmas cruise (22 - 29 December) and the Millennium cruise (29 December, 1999 - 8 January, 2000). It's possible to combine both cruises into an 18-day voyage with 15 calls. Later, she continues making two alternative weekly cruises from Guadalupe until later April: the Sun Antilles, northbound to Tortola and St. Maarten, and The Tropics Colours, southbound to Grenada and Barbados. The Mistral is the first stage of an eventual $740m three ship fleet investment programme, which is set to double the today Festival passenger capacity within three years. The ship looks well, with excellent passenger flow and adequate cabins. The Mistral must be surely one of the strong contenders in the today European market and, with her two future sisters, form the most impressive European fleet to conquest the niche market that her owner identified thirteen years ago.